About Us | The Leader Turkish Delight Producer of TURKEY. Our company has been established in 1993 as food marketing company and decided to produce Turkish Delight,Candy and Cezerye. Now our company is one of the biggest Turkish Delight and Confectionery producers of Turkey. The Turkish Delight which needs a professional production knowledge is produced in our modern institution. Our products reaches to big part of Turkey by our own marketing net and by our own shops.We can also import our products allover the world by our Foreign Trade Department. Turkish Delight was first produced in 15th century in Turkey as a sweet for the Sultans. Later, by order of the Sultans, it was developed and presented to the people for general consumption. It is classified as a sweet, but can also be enjoyed as an appetizer. Until 1990’s Turkish Delight was sold in form 5-10 kg cases. There were very few 500 g. packs. Now our company produces various weights, starting from 20 gr. up to 5 kg. and our product can be seen in well known supermarkets across the Turkey. Turkish Delight has become a well recognized product, and a desireable item on the shelves. It is usually found among the chocolate and candy products and sells well. It has good lasting qualities, both in winter and summer. The product melts in the mouth, tastes wonderful and easily digested. It has a shelf life of 12 months when correctly stored. 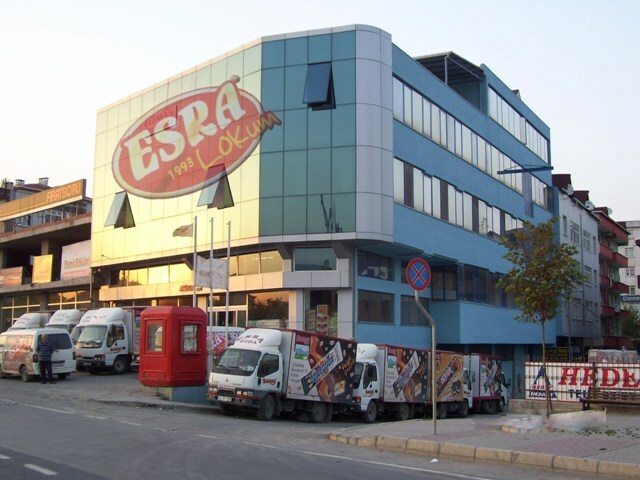 Our company aims Export its products to allover the world and want to give a chance to the all people of the World to taste Esra Turkish Delight.